Moving can be exciting, but when not planned efficiently and with some attention to detail, it can result in unwanted damage to your personal assets. When it comes to packing up your possessions, the quality and size of the boxes you use makes a whole lot of difference. The relocation process not only involves the right sized boxes but also pack the boxes carefully and how you load into your moving vehicle. So, before you call your removalists in Hawthorn for your big day, listed here the 4 important tips that will help you ensure that you select the right boxes for your move. Size Matters Group similar sized items together and then select the box size as per the stuff you are packing inside. Bulkier items like electronics and furniture require a whole box due to shape and dimension. Smaller items like ornaments and breakable can add up and packed into smaller boxes. Large sized boxes can be used for DVDs, books, electronics and smaller furniture pieces. Wrapping & Stacking To ensure that your items donâ&#x20AC;&#x2122;t smash into each other, itâ&#x20AC;&#x2122;s wise to properly wrap your breakables, individually. You need to ensure that your possessions are tightly packed together as possible and nothing is packed loosely. Place big items in the bottom to provide some support, smaller items on top, covering all the space. Bubble wrap is the best option to buffer it between items, stopping the gaps from any movement. Recycling is always a smart idea. Make uses of the few boxes in the storage for the moving process. For heavier items or expensive possessions, ensure that the boxes used are specifically designed for moving. 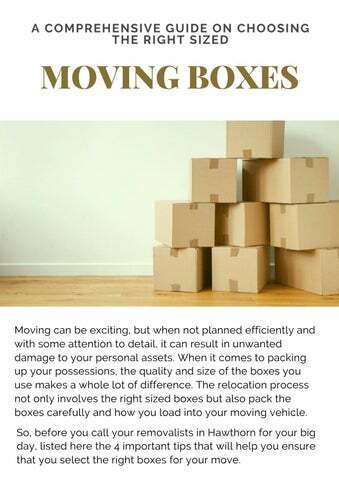 Specially made moving boxes are the best way to ensure that all your belongings will transit safely, without any damage. Spending a few dollars on new boxes is a great investment to avoid any damage. Old and used boxes are prone to tears and collapsing. Thus, stick to really sturdy boxes. Sealing each box with sturdy packing tape is a crucial element to your final packing stages. Ensure that the tape is covering all the sides of the boxes. It helps boxes from collapsing when it's stacked, meaning your items will remain protected and secure. Once taped in, use a permanent marker to label each box, what's contained inside. This works as a massive timesaver as during unpacking you donâ&#x20AC;&#x2122;t have to open every box to check the content before putting it inside the room. Following the above tips help you pack safely, ensuring all your possessions arrive safely and undamaged. But, why not hand over this painstaking task to removalists in Hawthorn and save yourself some time and potential injury. 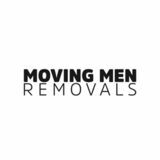 Give a call to Moving Men Removals, the expert removalists in Hawthorn and surrounding suburbs. We will bring our own boxes and pack it expertly, ensure that your boxes reach the destination safe and sound. Regardless, if you are moving your house or office, our friendly and efficient removalists in Hawthorn are willing to help you. We have years of proven experience, offering professional, safe and affordable moving service in and around Hawthorn. Call us and we'll complete the job, quickly and precisely.